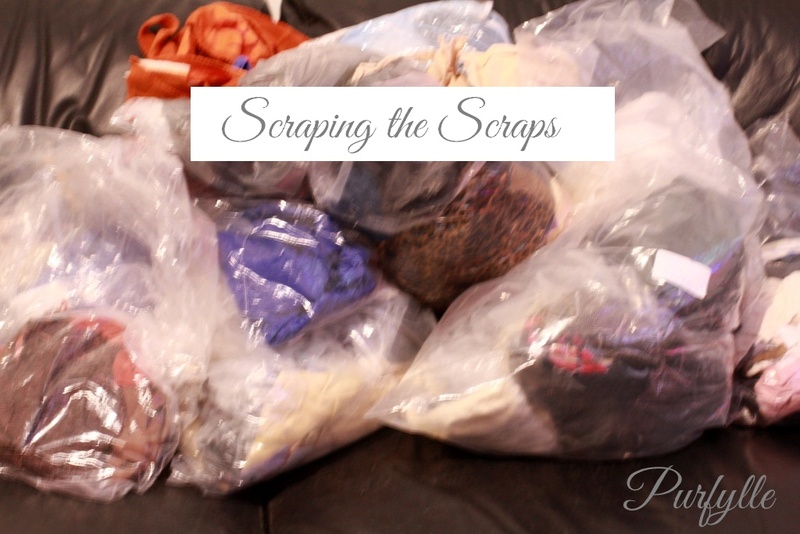 I have bags and bags of fabric scraps, you couldn't even really call them remnants. I have slowly been decluttering the fabric leftovers. It's hard, and I don't seem to get very far when I do try to whittle them down. I get all indecisive and start thinking of what I might be able to use all these scraps for, but the reality is I don't usually get around to using them. I really, really, reaaaallllly need to conquer this. This is a pile of the older fabric scraps that I have. There's bits of silk and cotton, poplin, linen, wool, velvet, velveteen, damask, faux wool and more. And there's this bag too. It's full of interfacing scraps. I went through it and there were two pieces that were maybe a foot square. I've kept those two bits. These four bags are going. There is just nothing usable in there unless micro quilting is your thing - which it totally isn't. I'm holding onto the wool and faux-wool scraps for now. I have a couple of ideas for what to do with the bits in these two bags, if it hasn't happened by Christmas though, they're going as well. I also found this top in amongst all the scraps. I discarded all the leftovers from that particular project a while back. The top has gone in the donation pile. Which just leaves these five bags which I've stuffed into a bigger bag. I should probably be getting rid of them too, however, I know I have some UFO's that I might need some of these scraps for and there's a usable bit here and there. I'll go through those next time, because today I just can't face any more scrap sorting. There's also the scraps I actually used. I just couldn't get rid of all those scraps without having used some first. I plan to share the project with you tomorrow. And I have more scraps, sad but true. One step at a time hey? I realise I need to stop keeping scraps. I try to keep them until a project is finished and that has saved a project more then once, but umm, so many projects don't get finished. And now it's taking a lot of time to get it all sorted out. I have to talk myself through it again and again and again. Right now I'm explaining to myself that sure, all those scraps could make great cushion stuffing but, there isn't going to suddenly be a shortage of scraps for stuffing if I just throw this lot out. It's okay to get rid of them. And really it's not the kind of stuffing you want for cushions anyway.....GET RID OF THEM. Just get them gone!!!! Phew. Right they're going. Yes, sometimes I have to give myself a good stern talking to. I can be exasperating. Do you hold onto your scraps? Do you use them up? I know some of you are really clever at using up little pieces of fabric.